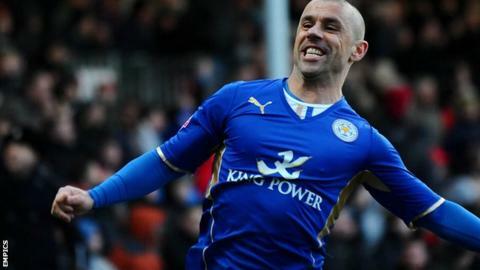 Veteran striker Kevin Phillips will retire from playing this weekend after helping Leicester City win promotion to the Premier League. Phillips, who scored the play-off final winner to earn Crystal Palace promotion last term, joined the Foxes in January. The 40-year-old, capped eight times by England, will remain with Leicester, joining the coaching staff next season. Kevin Phillips has been promoted to the Premier League five times. "For me it was the right time to bow out," said Phillips, who will face Doncaster in his final game. Leicester will lift the Championship trophy at the King Power Stadium on Saturday and despite their imminent return to the top flight, Phillips was keen to explore "new opportunities". "The body has been aching in the morning for a while now, especially the cold mornings with my ankles," he told BBC Sport. "Have I got another pre-season in me? Yes I probably have, but I'm going to take a rest and look forward to the future." The Foxes are his ninth professional club - having previously played for Watford, Sunderland, Southampton, Aston Villa, West Bromwich Albion, Birmingham City, Blackpool and Crystal Palace - in a career which began at Vicarage Road in 1994 and in which he has scored 287 goals. The most prolific spell of Phillips's 20-year professional career was spent at Sunderland, scoring 116 goals in 211 league games, and he became the only English player to win Europe's Golden Shoe award in 2000. He is also the last Englishman to win the Premier League's Golden Boot, scoring 30 goals in that season and told BBC Sport his proudest moment in the game was making his England debut in Hungary in 1999. Phillips made five substitute appearances for Palace this term before being released by mutual consent in January. He has become both Leicester's oldest ever outfield player and goalscorer, having also set the record for oldest player to feature for Crystal Palace in the Premier League earlier this term as well.